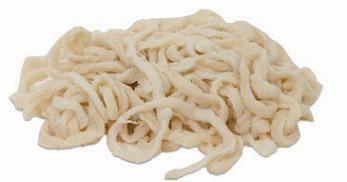 You�re viewing our Sausage Maker beef middles � 55-60 mm (2 1/8"-2 3/8") � makes 80+ lbs. This non-edible beef casing can be used for liverwurst, bologna, summer sausages, cooked or dry cured salamis. Packed in purified salt. Flush with tap water before using. Salted casings have a very long shelf life when stored properly. When refrigerated, packed liberally in purified salt, they have an indefinite shelf life. Not edible. Random lengths � 57 feet will stuff 80-90 lbs. Cannot ship outside U.S. These natural casings are shipped to you in a vacuum sealed bag packed in salt brine and they do not require refrigeration until after the sealed bag is opened. After the sealed bag is opened, the casings must be refrigerated, and they can generally be stored in their salt brine in the refrigerator for up to a year. If you will not be using all of the casings at once you can remove and rinse only the length of casings you will be using and leave the unused casings in the salt brine in the resealable zipper bag for later use. We recommend that you do not freeze the casings as they may become dry, tough, and more prone to breaking and bursting when your sausage is stuffed or cooked. Please contact us with any questions you may have about our products. 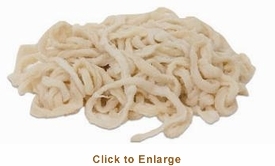 Scroll down to view our Sausage Maker beef middles � 55-60 mm (2 1/8"-2 3/8") � makes 80+ lbs.